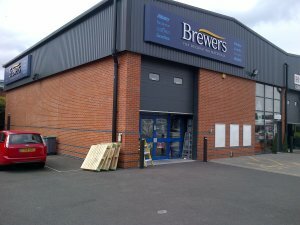 Our team in the Burton-upon-Trent Brewers Decorating Centre is small, but impressively knowledgeable. Between us we have more than 40 years’ experience in the decorating industry and one of us is a decorator by trade; together we have a strong understanding of how to use our products and how to overcome the challenges our customers face. We carry a good range of trade and designer paints, wallpapers and decorating sundries and equipment. The branch is off Dale Street, easily reached from the roundabout where Evershed Way meets Shobnall Road. We have customer parking, including disabled parking, and the store is wheelchair-accessible. Head south-east on Shobnall Road and at the roundabout, continue straight over onto Dale Street, the store will be located on the left. Head north-east on Anglesey Road, at the roundabout take the third exit onto Dale Street and the store is located on the left. Head south on Anglesey Road, at the roundabout take the first exit onto Dale Street and the store is located on the left. Head-west on Evershed Way, at the roundabout take the fourth exit onto Dale Street. The store is located on the left. Head north-east on Uxbridge Street, turn left onto Moor Street and follow this round around until reaching a roundabout, take the first exit onto Dale Street. The store is located on the left.